We believe that small cabin groups and caring, supportive counselors provide our campers with the best opportunity for personal growth and learning. Campers are grouped together into cabin groups during their stay at camp, typically with 6 to 8 campers and one (or more) counselors per group. Cabin groups function as a family while they are at camp – they share a living space, eat meals together, and do almost all activities together as a group. They have the same counselor(s) all week, so there are lots of opportunities for team-building throughout the session. In most cases, campers are assigned to single-gender cabin groups based on grade. Some programs, including Adventure Trips, Kiwanis, and Nocturnal, are gender-inclusive, although housing is typically separated by gender in separate tents, hammock platforms, or cabins. Campers in Classic Camp may be housed in gender-inclusive (co-ed) housing if they choose that option, although we cannot guarantee that this will be available during all programs and sessions. For campers whose identified gender does not match their assigned gender, we invite you to select the cabin option that best suits you. Private bathrooms, showers, and changing areas are available to all campers. In most cases, campers are assigned to counselors (primary care staff) of the same gender. In some cases, counselors are selected to work with children of a different gender. Only same-gender staff will supervise showering and changing, but all staff may assist with nighttime supervision in the cabin. Please note that we are a gender-inclusive camp; all campers will interact with staff of a different gender in some capacity during their stay at camp. We want to be inclusive of the needs of all campers and parents, so please let us know in your registration if you have any strong preferences regarding your child’s housing or counselor assignment. Cabin groups of the same age are grouped together into clusters called “units”. Although most activities are done by cabin groups, there are plenty of opportunities for inter-unit and all-camp interaction. While units are typically organized by grade level, unit placements can vary by session or year depending on enrollment. 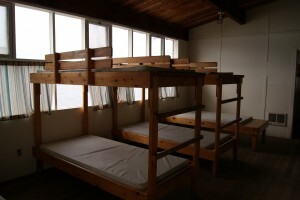 Some Specialty Camps are integrated into the Classic Camp units and others have their own unit. Please note that there is some overlap between ages assigned to each unit. We cannot guarantee placement in any particular unit based on grade/age – it is entirely dependent on enrollment each session. We do not permit buddy groups larger than 3 friends. Groups of 4 or more will be asked to split into multiple cabins; we will consult parents to determine the best way to split buddy groups. In most cases, we do not recommend that siblings be placed in a cabin group together. You can make buddy requests during registration, or by calling our office after you have registered, up to one week before camp begins. Cabin assignments are made only a few days before the start of camp. To ensure that we have placed buddies together, you can ask the staff during check-in to verify their cabin placement. Note: In Horse Camp, buddies can be registered for different riding levels (i.e. Beginner Riding and Intermediate Riding) and still be placed in a cabin group together. Camp cabins are basic but comfortable. All are fully enclosed with electricity; some have windows and heat for year-round use and others are unheated with screen windows. Beds are either bunk or stand-alone wood frames with foam mattresses. In most units, bathrooms are in a central shower house, a short walk from the cabin. Note: Campers in some specialty programs live in alternate housing. 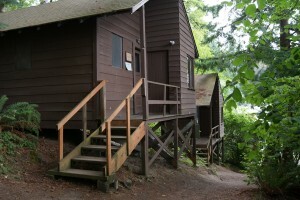 Adventure Trip participants live in cabins while on site at Camp Sealth, but will camp in tents during their off-site trips. Nocturnal campers stay in tents; and Kiwanis campers stay in a remote hammock unit.